The DSR-M dissolution sampling robot is designed specifically for the sample transfer and sample processing from a six to twelve vessel dissolution bath. This unique versatile instrument allows samples to be collected over very short time intervals. 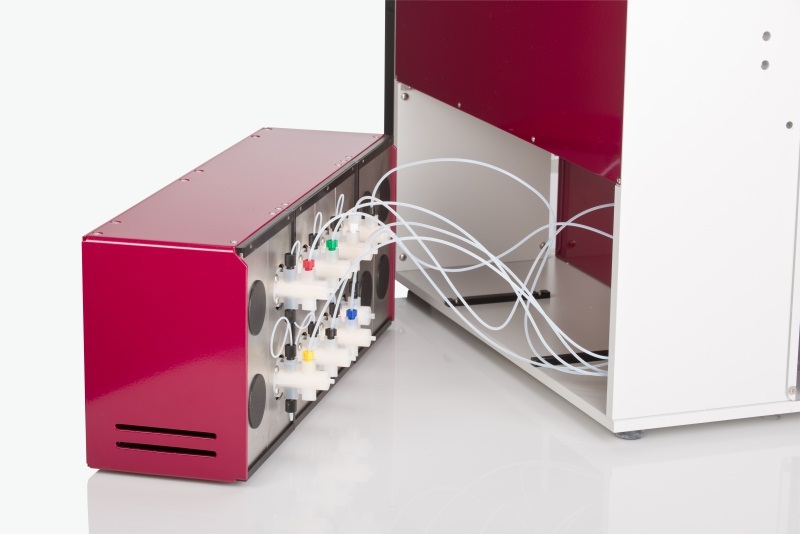 The DSR-M can be equipped to collect, dilute or process samples for following UV-Visible or HPLC measurements. It can also be used for dissolution medium replenishment to conform to USP/EP volume loss rules. 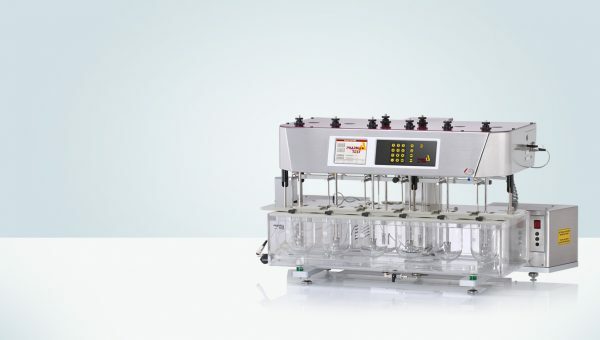 To offer the highest volume precision, between six and thirteen piston pumps are used for sample removal and media refilling (optional), one dedicated pump for each channel. No time consuming pump calibration is needed. The advanced design of the system means that it is always ready for operation. The pumps are integrated into the DSR-M as a compact CAT-M pump module. 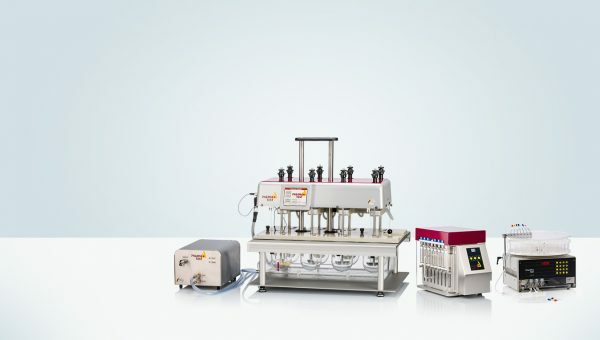 The sample preparation station, Z-arm and needle, can be used to dispense into septa sealed HPLC vials or dilute the samples for later UV/VIS analysis. Keeping the samples in sealed vials helps to avoid evaporation, especially if sustained release samples are tested. 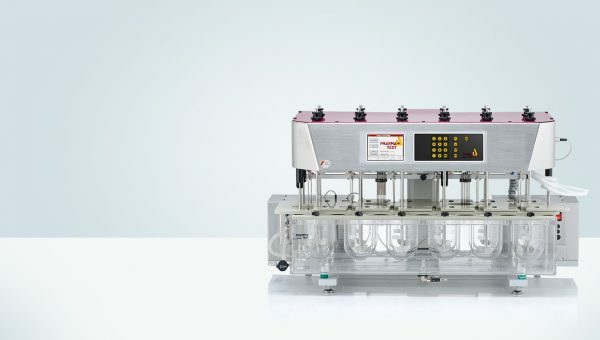 The DSR-M can be connected to a Pharma Test PTWS-series and PT-DT70 dissolution bath. If the DSR-M is connected to a PTWS 310/610/1210 or D610 system the sampling probes are connected to the EPE auto sampling manifold. 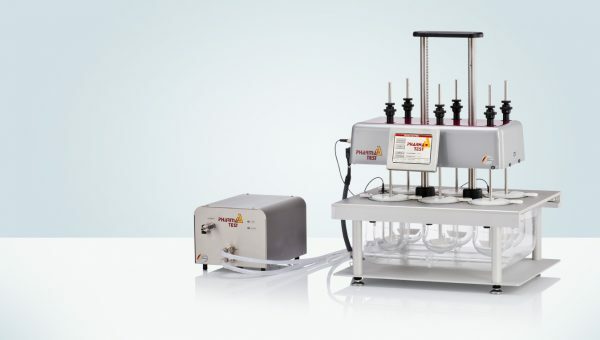 The motorized EPE lowers the sample probes into the corresponding sampling position which can be set for either 500 or 900ml total media volume. Sampling cycle information is programmed directly at the dissolution bath using the method filing system. Manual sampling from a dissolution test instrument is not only time consuming but also limits the reproducibility and is close to impossible if sustained release products have to be analyzed over prolonged time periods. The Pharma Test DSR-M provides a neat solution for this automation procedure. Up to 20 sampling cycles can be run (10 if dilution is enabled). These are collected in two racks inside the DSR-M. The second rack is used either for sample collection or for sample processing, such as dilution. 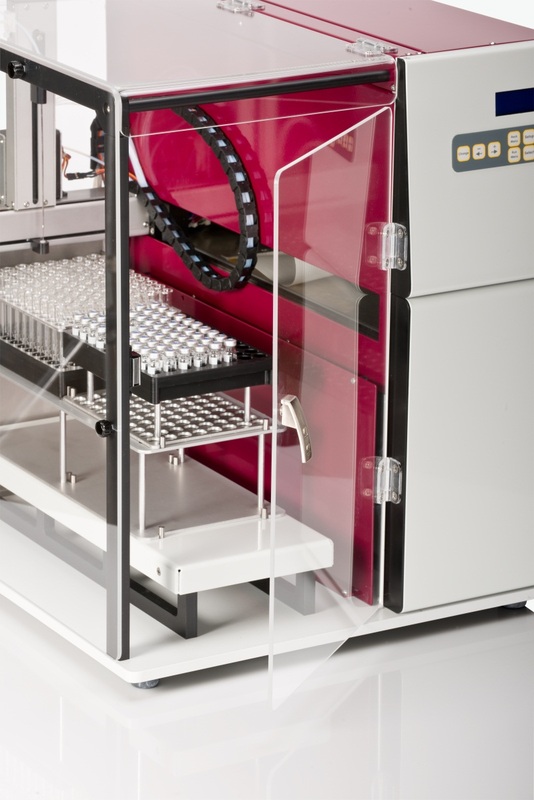 The unique rack design allows the user to use standard open vials or septa closed HPLC vials with the same rack. Filtration of the collected samples can be done using 5 to 20 micron filter tips which are attached to the sampling probes and also using the MFC-12 manual filter changer which is integrated into the DSR-M tubing and may hold round filters from 1 to 0.45 micron. Since these round filters pass liquid in one direction only, an additional DSR-MVS valve station is required to create a bypass for the return flow. If dilution of sampled media is required the DSR-M will use one of the two racks to collect the samples from the dissolution vessels and the second one will hold empty vials into which the diluted media will be dispensed. When sampling is finished the DSR-M will start to dilute. It will take the volume which needs to be diluted from the sampled media dispense it into the empty vials and add the diluent while mixing both using air. All vials are treated the same time in either open or septa-sealed vials. The DSR-M racks are installed on a tray that can be moved out of the DSR-M easily to transfer the vials and to fill up the rack with new empty vials or glass tubes. 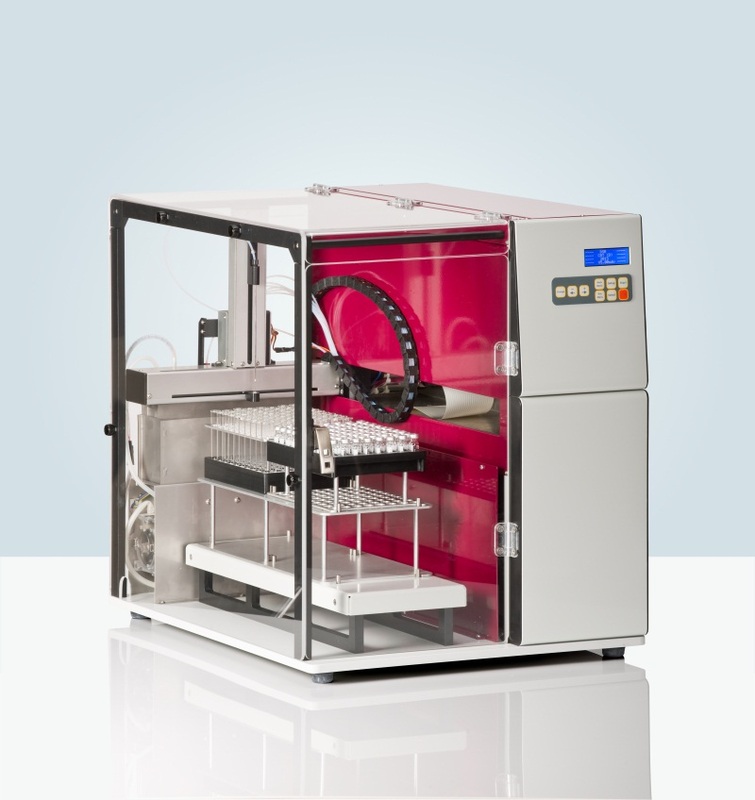 The DSR-M is completely enclosed by transparent acrylic glass to protect the operator from the moving arm and the samples from any external source. Unlike most systems the DSR-M does not use syringes but valve-less piston pumps. These pumps do not need any time consuming pre-filling and emptying cycles and change of valve positions. Also the dead volume is much smaller compared to conventional syringes and valve installations. A rinsing valve is connected to each sampling and refilling valve to clean them using fresh diluent or media to avoid clocking due to the recipients inside the collected media. Fast coupling systems allow the change of each individual pump head whenever this should become necessary. There are no wear and tear parts inside the pumps needing to be replaced; the precision is kept for the total life time. Flow Rate Minimum 1 ml/min. ; Maximum 41 ml/min.